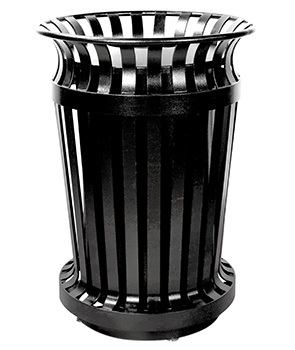 From Top to Bottom these imported 32 gallon Curved Flare Top Trash Receptacles stand tall and strong. Constructed with 1-9/16" vertical steel slats tied together with two 2-3/8" steel slat bands—one near the neck and other at the base. Featuring a convex lid with a 9-3/4" 'pitch-in' disposal opening. This encourages proper waste disposal, keeping your areas litter free. There is a hidden stainless steel security cable to keep the lid attached, so never worry about losing it. Powder-Coated black steel liner & stainless steel surface mount hardware are included.